This article is about the comic series. For the multiplayer map, see Bloodline. 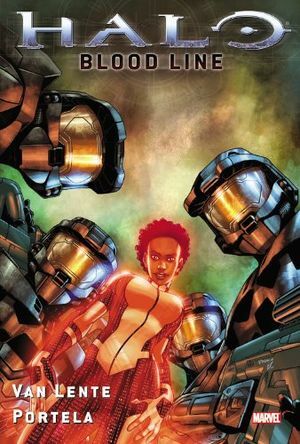 Halo: Blood Line (formerly Halo: Spartan Black) is a five issue comic book series published by Marvel Comics. It follows Team Black, a team of stranded SPARTAN-II commandos, set before the Fall of Reach in mid-2552. A hardcover edition was released on August 18, 2010. Narrated by the AI construct Iona, the parts of the story are told in nonlinear fashion, with the narrative occasionally jumping to the Spartans' training days, in flashbacks explaining the team's history. During their training, Black-One (Margaret-053) and Three (Otto-031) secretly had a romantic relationship. Black-Four (Victor-101) was jealous of them and reported them to CPO Mendez, who sent both to the brig. Red Team heard of this and tracked down Black-One, and gave her a beating to send the message that her team should take their training seriously. One lost her left eye in the ensuing brawl, and later, Black Team gave Red Team a beating in return and got thrown in the brig for ten days as a result. The team would never speak of the incident again, and while Four put the incident behind, deep down, his jealousy toward Three remained and he even developed a delusion that he had the relationship with One. The story's main narrative begins as Team Black is sent to a covert mission in uninhabited space. Their cryo chambers are hidden aboard the ONI vessel Long Time Coming, which crashes on an uncharted moon after being hit by unknown energy bombardment. Meanwhile, the Covenant carrier Clarity of Faith suffers a similar fate. Its command crew, led by Shipmaster Thon 'Talamee and his brother and second-in-command Reff 'Talamee set off to explore the moon's surface. Black-One, Three and Four move out of their ship and soon engage the Covenant, while Black-Two (Roma-143) stays behind to send a distress call. Soon after, Black-One, Reff and several other Covenant soldiers are abducted by mechanical Gatherers. Black-Four and Three reluctantly ally with the Covenant forces in order to rescue their captured comrades. They then proceed into the vast underground installation where the captives are taken. Deep inside the installation, Black-One and the Covenant are encountered by the installation's Monitor, 686 Ebullient Prism, who informs them that they will be vivisected in order to investigate immunity to the Flood. After Two follows the rest of the Spartans into the facility, the Monitor hacks into Four's and Two's MJOLNIR HUDs, tricking them into attacking each other, as well as coming close to breaking their temporary truce with the Covenant. Four's grudge against Black-Three resurfaces as a result of the manipulation and he attacks Three. Meanwhile, Black-One and Reff break out of their cells. Once they manage to escape and blind the Monitor, the two discover the Installation's control center. Accessing a console, One learns that a Covenant fleet is approaching their position. She tries to contact the rest of her team but finds that Three and Four are engaged in a brawl. To stop this, One tells Four that she forgives him for the incident, giving Three the opening to jack in Iona's data crystal chip into Four's MJOLNIR armor, causing an influx of the team's various missions together to bring Four out of his tantrum. Suddenly, One is slammed into the console by a Hunter and knocked out. Reff tries defending to Thon that the Spartan saved him. Thon replies that he honored the truce only to rescue him, and then inquires how to contact the holy city of High Charity. However, Reff proclaims that they should instead blow the servants of the Prophets out sky, having developed a delusion that his kidnapping was the work of destiny. Thon proceeds to kill Reff for speaking heresy, but is impaled by Reff instead. Soon, Prism arrives at the control center and vaporizes Reff. Black-One manages to recover to assist the rest of the team in stopping Prism, directing him into the path of the Installation's main gun, vaporizing the Monitor while simultaneously sending the Covenant fleet crashing down to the moon. Black Team then begins to fight through the surviving Covenant to commandeer a ship with a functional Slipspace drive.